Voters went to the polls on Tuesday, August 14, for unusually dramatic Minnesota Primary Elections. Local contests — Brown County Commissioner District 5 and Brown County Sheriff — no doubt were responsible for the higher-than-usual voter turnout for a Primary Election in Springfield and Brown County..
Springfield had a good turnout for the Primary Election with 388 votes cast — more than five times as many as turned out for the 2016 Primary (69). Bashaw Township claimed the largest voter turnout in Brown County with 73 votes, compared to about a dozen that usually showed up for Primary Elections. Brown County Commis-sioner District 5 candidates Lynn Anderson, and Jeffrey Veerkamp won the Primary race. Anderson, owner/operator of a regional trucking company that hauls agricultural commodities across Southwest Minnesota, received 471 votes (39.25%) of the vote. Veerkamp, owner and operator of the Comfrey C-Store and farmer, received 404 votes (33.67%) advancing to the November 6 General Election ballot. Jack Vogel received 173 votes, and Derek Tonn 152 votes. 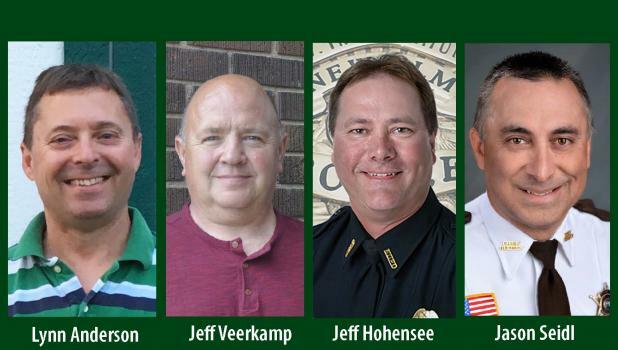 Brown County Sheriff candidates Jason Seidl and Jeffrey Hohensee will face off in the November 6 General Election.